I never realized that I braced my shoulders and held my breath while typing. Now I know the importance of not doing this, and have tools to change. Sit on the edge of your chair and hold your mouse and then begin to draw with your mouse, the letters and numbers of your street address; however, draw the letters backward by beginning with the last letter of the street address. Draw each letter about 1 1/4 inch in height, and then click the left button after having drawn the letter. Continue to draw the next letter. Draw as quickly as possible without making any mistakes as if your boss is waiting for the results. Start now, and continue for the next 30 seconds. Now, observe what happened. Did you hold your breath, tightened your neck, shoulders, and trunk, forgot to blink as you drew the letters with your mouse? Imagine what would happen if you worked like this hour after hour: Tension headaches, shoulder pain, exhaustion? Research at San Francisco State University has demonstrated that with biofeedback 95% of employees automatically raised their shoulders, and maintained low-level tension in their forearms while keyboarding and mousing.They also increased their breathing rates , and decreased eye blinking rates. Almost all employees studied thought that their muscles were relaxed when they were sitting correctly at the computer, even though they were tense, as is shown in Figure 1. Figure 1 is a representative recording of a person working at the computer. Note how 1) forearm and shoulder (deltoid/trapezius) muscle tension increased as the person rests her hands on the keyboard without typing; 2) respiration rate increased during typing and mousing; 3) shoulder muscle tension increased during typing and mousing; and 4) there were no rest periods in the shoulder muscles as long as the fingers are either resting, typing, or mousing. By permission from: Peper, E. (2007). Stay Healthy at the Computer: Lessons Learned from Research. Physical Therapy Products. April. While working at the computer most people are captured by the computer, and are unaware of how their bodies react. 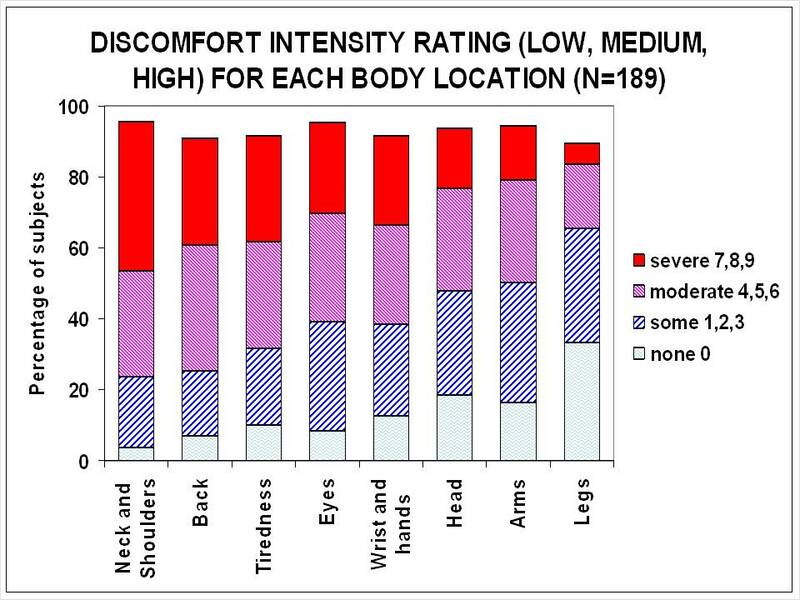 Computing during the day and surfing the net at night, most people report neck and shoulder tension, back pain, eye irritation and/or fatigue otherwise labeled as Stress Immobilization Syndrome, see figure 2. Figure 2. Distribution of reported symptoms experienced by college students (average age 26.3 years) while working on the computer near the end of their semester (reproduced with permission from Peper, E., & Gibney, K, H. (1999). Computer related symptoms: A major problem for college students. Applied Psychophysiology and Biofeedback. 24 (2), 134. Get up and do large movements (stretch or walk) for a few minutes.